So, here’s the deal: DC Comics character Barry Allen, better known to many as The Flash, is coming to Arrow in Season 2, opening up the world to the larger DC universe. It could lead into a Flash spin-off if all goes well. 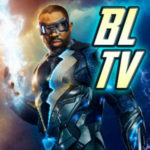 Geoff Johns, Greg Berlanti, and Andrew Kreisberg are writing the episodes to introduce Barry, which will see him coming to Starling City in episodes 8 and 9 of Season 2. We’ll see Barry Allen a third time in Arrow Season 2, in episode 20 which will be directed by pilot master David Nutter (helmer of the first episodes of Arrow and Smallville) and, we hope, lead into a show of his own. – Johns compares Barry Allen’s arrival on Arrow as being like Barry’s arrival in the comics in Showcase #4, when he ushered in a Silver Age of DC super heroes. “In the same way, he’s going to usher in some new and pretty insane concepts to the Arrow world, but like Andrew said, in a very grounded way.” Characters we know from Arrow will react to the extraordinary changes to their world, hopefully in a very realistic way. “These ‘powers’ won’t be treated as commonplace on the show. They will be extraordinary events, and the world and the characters in them will react accordingly,” Kreisberg says. Barry’s presence is “in addition to Arrow.” “We’re not trying to take away anything from Arrow; we’re really trying to add to Arrow,” Kreisberg adds. 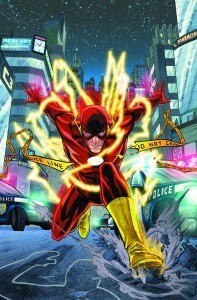 – Doing The Flash as a spin-off was an idea that came from Greg Berlanti. The Flash has always been a favorite for him, and of course has always been well loved by Johns and Kreisberg. 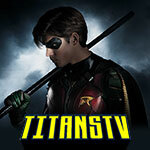 – “We’re really focusing on making these episodes the very, very best they can be. 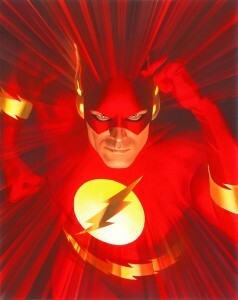 Flash deserves it,” Johns says. – “He’s a cop. He follows the law, he follows the rules… the last thing in the world he would ever think about is being a vigilante,” Geoff Johns says when detailing differences between him and Oliver. Kreisberg says that Oliver and Barry will learn from each other. – Casting for the role of Barry Allen was waiting for today’s news to come out first. Now that it’s out there, the search can begin. – The visual effects for The Flash will be unlike nothing we’ve seen before from the character on things like Smallville or the old Flash TV show. Some inspiration may come from the artwork done by Francis Manapul in The Flash comics from DC Comics. – As Barry’s first visit to Arrow will be in Starling City, we probably will not see other characters from the Flash world until Episode #2.20 of Arrow.